Hotline Client is the client side end of the Hotline software suite created by Adam Hinkley and released by Hotline Communications. The client application can connect directly to the Hotline Server (software) via DNS or IP, or interface with the Hotline Tracker (software) to view an index of servers registered with a tracker. The Hotline protocol was also unofficially ported to *nix based operating systems. Unofficial clones are also available under Macintosh and Windows along with the official software. A complete list of Hotline related downloads can be found at https://preterhuman.net/gethotlinekdx.php. 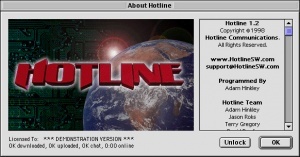 Version 1.2.3 of the Hotline software suite was widely used and can be considered the most popular version of the software. This version introduced threaded news as opposed to the older style used by version 1.2.3. This page was last modified on 5 April 2019, at 23:21.